Market volatility never arrives at a convenient time. This past week the global stock market (measured by the MSCI All Country world index) fell 5.51%. Here’s a Q & A discussion with Jason Close, CFA, CFP®, Director of Investments at Planning Alternatives about the recent volatility. Q: Why was the stock market so volatile last week? A: Markets digested some worrisome economic data. Chief among the concerns are a possible economic slowdown in China, falling oil prices and a Federal Reserve decision that may potentially raise interest rates. Q: Is this level of volatility unusual? A: Declines of 5% in the MSCI All Country World index have occurred an average of 7 times per year. The past week’s losses feel extreme because we’ve been enjoying a volatility drought. It’s been over 3 years since the index dropped 10% or more. That’s the longest stretch on record for the index. We’re not saying the week’s losses will lead to 10% declines – which tend to come about twice a year, or 20% declines – which tend to come every two years. But our research and experience tell us temporary losses are unavoidable and that further volatility is always possible. Q: What should an investor do? A: Market declines are never pleasant, but investors should keep perspective. Volatility will always be a part of the investing journey. The best way to weather the volatility storm is to have a set course. Now is a great time to review your overall financial plan with your advisor. They are well equipped to provide perspective during turbulent times. 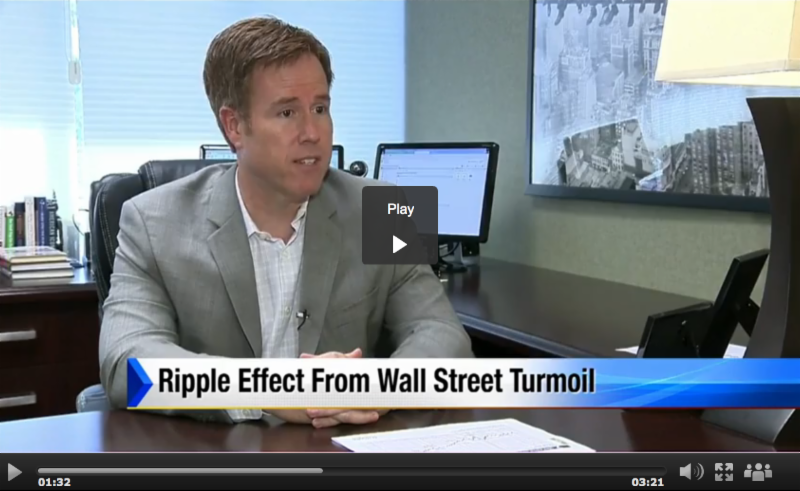 On Friday, August 21st, NBC’s Detroit Channel 4 (WDIV) sought comments from Planning Alternatives’ President Nathan Mersereau, CFP®, regarding the market volatility during the past week. Click below to view the interview (and please excuse the brief embedded pop up ad at the beginning of the video clip). WEBINAR | What in the World is Going On? We are pleased to announce that Jeffrey Kleintop, CFA, Chief Global Investment Strategist at Charles Schwab will be our webinar guest speaker on September 23 at noon (EST). Jeffrey is nationally recognized expert on global investing and can provide insight into the recent market volatility as well as perspective on events in China, developing trends in Europe and thoughts on the interplay of global economies and currencies. Please save the date for this timely webinar. We will be sending out a separate email invitation within the next 2 weeks with a registration link. You can register for the webinar at that time. We know that investing is a journey and that there will always be headlines that produce feelings of uncertainty. Please contact us at any time. We’re here for you and look forward to discussing any item that’s on your mind. Please tell others about us. We would love to meet anyone you know who could benefit from a clear perspective when times look tough. Referrals are the main way we meet new clients. Thank you!